Botrytis blight caused by Botrytis cinerea is one of the most common fungal disease of greenhouse crops. The disease is often referred to as gray-mold because it produces a crop of gray fuzzy-appearing spores on the surface of infected tissues. A variety of plants including ornamentals, vegetables and herbs are susceptible. Management of environmental conditions, sound cultural practices, and fungicides will control this disease. Depending on the host and environmental conditions, Botrytis can cause leaf and flower blight, fruit rot, cankers, damping off and root rot. Plants may be attacked at any stage but new tender growth, freshly injured tissues and aging or dead tissues are preferred. Spores are produced in abundance on lesions as well as on plant debris left on benches, the greenhouse floor and cull piles. Spores are easily disseminated by air currents and splashing water. Given the common occurrence of Botrytis in greenhouses and the relative ease in which it can propagate itself, greenhouse managers must avoid conditions that are conducive to disease development. Like other fungi, Botrytis has a specific range of temperature and relative humidity that is necessary for spore germination, infection and disease development. Germination of spores and infection of the host is dependent on a film of moisture for 8 to 12 hours, relative humidity 93% or greater, and temperatures between 55 - 75 F. Botrytis blight is more prevalent in the spring and fall months. Regulation of temperature, humidity and leaf wetness duration can prevent disease development. An integrated approach, employing sanitation, monitoring, environmental control and fungicides is required for the successful management of Botrytis blight. Control weeds and remove plant debris between crop cycles and during production. Space plants to allow for good air circulation and reduction of humidity within the canopy. Reduce humidity. Reduction of humidity by heating and ventilating is relatively inexpensive compared to the loss of revenue that can result from Botrytis blight and other plant diseases. Warm air holds considerably more moisture than cool air. In the evening, as warm air becomes cooler, the relative humidity (RH) rises until water vapor begins to form a film of moisture on surfaces (dew formation). This film of moisture is essential for Botrytis (and other fungal pathogens) to germinate and cause infection. To prevent excessive humidity and dew formation, turn on the heat and open the vents. The warm humid air is ventilated to the outside as the cooler outside air is drawn into the greenhouse. As the incoming air is heated up, (even if it is saturated) the RH drops significantly. This air exchange should only take 5 or 10 minutes. The energy necessary to run fans and to provide heat is not significant. Under some conditions, this cycle may have to be repeated several times during the evening. The process can be simplified by installing timing devices. Moving air, even in a closed greenhouse, helps to reduce moisture on plant surfaces. Horizontal air-flow produces more uniform temperatures and reduces the probability that cool spots in the greenhouse will develop a condensation problem. See fact sheet from this list: Horizontal air-flow. Humidity can also be reduced by watering in the morning when it is cool so that rising temperatures absorb moisture. azoxystrobin 11 Heritage Broad crop clearance. Do not make consecutive applications. 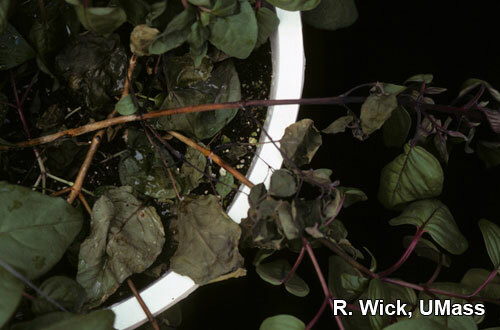 Viola, pansy and impatiens may be damaged by incorrect application. chlorothalonil M5 chlorothalonil, Echo, Manicure, Daconil, Exotherm Termil, Pegasus Broad crop clearance. May discolor blooms on petunia and hydrangea. Do not use in high pressure spray equipment. See Exotherm label for additional precautions. copper hydroxide M1 Champion, Nu-Cop, Cupro Test on crops not listed on label before applying to entire crop. The pH of the spray solution should not be less than 6.5 to avoid phytotoxicity. Do not tank mix with Alliette. copper salts M1 Camelot See above. copper sulfate pentahydrate NC Phyton 27 See label. dichloran 14 Botran Chrysanthemums, Geraniums, Gladiolus, Roses, Hydrangea. fenhexamid 17 Decree Avoid more than two consecutive applications. Test on crops not listed on label before applying to entire crop. African violet, geranium, petunia, poinsettia and rose. fludioxonil 12 Medallion Broad crop clearance. Drench applications to impatiens, New Guinea impatiens, and geraniums may cause stunting and chlorosis. iprodione 2 26GT, Chipco 26019, Iprodione Pro Broad crop clearance. Do not apply to spathiphyllum, pothos, or impatiens. mancozeb M3 Dithane, Fore, Protect T/O Broad crop clearance. Do not apply to French dwarf ro Signet-type marigolds. Apply preventatively. polyoxin D 19 Veranda O Use experimentally on crops not listed on label before applying to entire crop. trifloxystrobin 11 Compass Broad crop clearance. Do not make consecutive applications or alternate with other Group 11 fungicides. triflumizole 3 Terraguard Test on crops not listed on label before applying to entire crop. Do not use on impatiens. chlorothalonil plus thiophanate-methyl M5 & 1 Spectro Broad crop clearance. Test on crops not listed on label before applying to entire crop. Do not use in high pressure sprayers. copper hydroxide plus mancozeb M1 & M3 Junction The pH of the spray solution should not be less than 6.5 to avoid phytotoxicity. iprodione plus thiophanate-methyl 2&1 26/36 Broad crop clearance. Do not apply to spathiphyllum, pothos, or impatiens. Greenhouse populations of Botrytis rapidly develop fungicide resistance with repeated applications of fungicides with the same mode of action (FRAC Group). Resistance to thiophanate-methyl (Cleary's 3336) and iprodione (26 GT) has been reported in Botrytis populations. Group 11 fungicides (Heritage, Compass) are very susceptible to fungicide resistance development and should not be applied consecutively or alternated with each other. Always alternate fungicide applications between materials with different modes of action to prevent resistance developement. Another strategy is to tank mix different FRAC groups or add protectant fungicides like mancozeb, copper or chlorothalonil to systemic fungicides. New England Greenhouse Floriculture Guide, A Management Guide for Insects, Diseases, Weeds and Growth Regulators. Reducing Humidity in the Greenhouse (on this list) by John Bartok, Univ. of Conn. Prepared by Dr. Robert L. Wick, Department of Plant, Soil and Insect Sciences, Room 111, Fernald Hall, University of Massachusetts Amherst, MA 01003. Tel. (413) 545-1045 Fax (413) 545-2532. 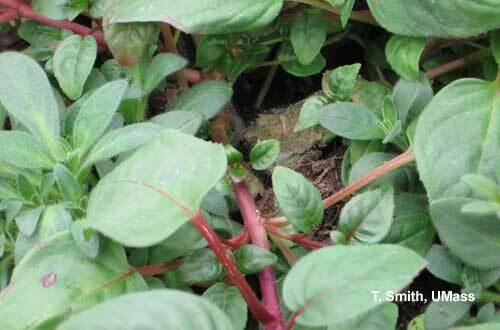 Ohio State Extension's Plant Pathology Fact Sheet on Botrytis Gray Mold in Greenhouse Floral Crops.